Harrogate Town supporter Dave Worton's latest weekly column. It’s 10 minutes into a bitterly cold second half against York City in the FA Trophy. "Dad?" says Molly (my daughter). "Can your toes actually fall off?" she enquires. Now, I must admit I didn’t see that one coming. Well, we’d already had the chips, and the goal-kick situation is a mystery to everyone I talk to, but you get my point. We’re stood in the Kop with the Town fans, freezing sleet lashing into our faces, toes frozen, and I can totally see where my daughter’s coming from. "Don’t be daft," I reply. In truth, it had taken me a while to cotton on to the weather conditions. My brain normally associates foul weather at football matches with a mud bath of a pitch, yet here we were watching football on a pristine 3G surface. It’s only when surface water started becoming apparent, and Molly initially refused to come out of a very cosy 1919 bar for the second period, that I realised just how bad it was out there. The anticipated atmosphere had been muted by the weather. 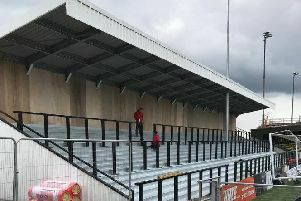 The attendance was less than half of the turnout for the glorious derby in National North last year and fans huddled into the stands, staying clear of the front rows, and certainly clear of any uncovered areas of the ground. Water cascaded down from the Shed End roof and the sleet was freezing on contact with the ground. Town came out and really turned the screw in the second half, dominating the ball with the weather behind them. Yet for all the possession and half-chances, we were grateful, once again, to defender Liam Kitching for lashing a loose ball high into the rain sodden net. Thus, victory over our neighbours for the third time in three matches was secured, cementing Town’s position as the pride of North Yorkshire in the process. Who would have dreamt of that when the visitors were in the old Division Two? Seeing York play really drove it home as to how far Town have progressed in the last year. To these eyes, at times they looked every inch an average National League North team, and a notch below most other opponents we’ve seen at Wetherby Road this term. That Town have stepped up to the higher level so well is a credit to every one involved with the club. I’d like to report that fans and players celebrated long and hard after the final whistle, but in truth, I’ve never seen players move so fast for the dressing rooms, as we and half the Kop dashed for the warmth of home and a chance to check that toes were all present and correct. It was a very strange local derby indeed.